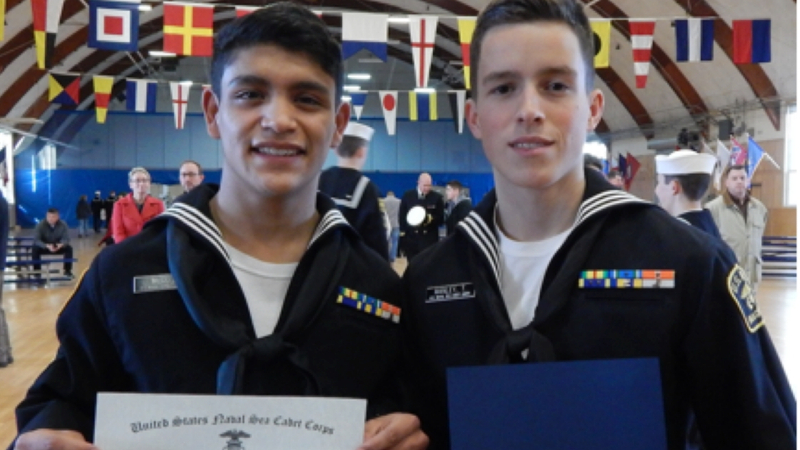 US Naval Sea Cadets Robert McGuire (pictured left) of Conshohocken and Thomas Manley (pictured right) of Lafayette Hill were recently awarded certificates for successfully completing advanced Sea Cadet training over seven days at the Naval Station Newport in Newport, Rhode Island. McGuire and Manley are currently sophomores at Plymouth Whitemarsh High School. McGuire completed the Petty Officer Leadership Academy course, designed for Sea Cadets who are rising leaders within the US Naval Sea Cadet Corps (USNSCC). The training is academically intense, requires regular participation in lectures and small group discussions, requires nearly 100 pages of reading per night, and is both reflective and theory-based. Manley completed the Emergency Medical Seminar course instructed by Emergency Medical Technicians, Paramedics, Navy Hospital Corpsmen, and other medical professionals. The focus was on emergency medicine, including CPR, AED, splinting, shock, controlling bleeding, immobilizing patients, and lifting & moving patients. USNSCC is a national youth leadership development organization that promotes interest and skill in naval disciplines while instilling strong moral character and life skills through leadership and technical programs modeled after the Navy’s professional development system. The USNSCC s for young people ages 13 through the completion of high school to expose cadets to the prestige of public service and a variety of career paths through hands-on training with our nation’s armed services. One weekend a month McGuire and Manley train at the Coast Guard Training Center in Philadelphia, PA. They both hope to pursue a career as Naval Officers.